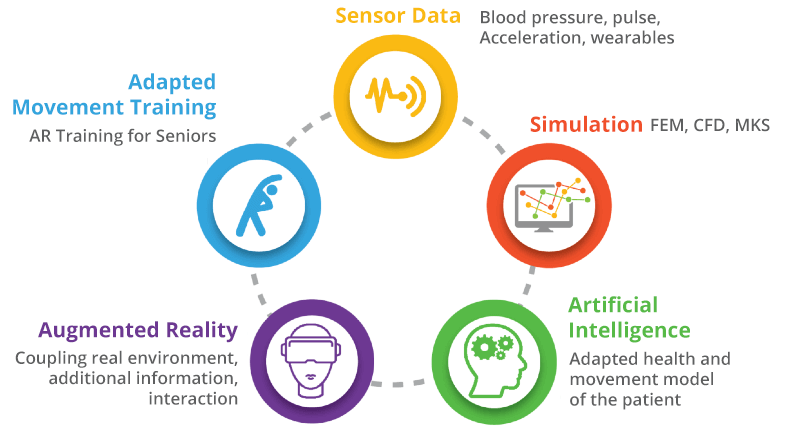 The aim of the BewARe project is the development of a technically supported movement and mobility training for seniors with hypertension based on an intelligent augmented reality system. Various exercises from the training components endurance, strength, mobility and coordination will be provided and individual stress norms will be taken into account. Augmented reality and sensor technology in movement, coordination and reaction training for geriatric medicine. This includes gamification approaches to increase motivation, change behaviour and strengthen resilience and persistence. AR and sensor technology as an interface for an intelligent system to support senior citizens in health issues. 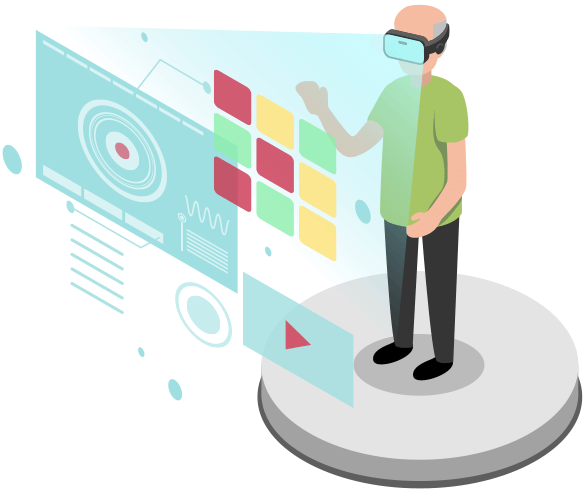 The use of AR glasses makes it possible to record the environment, what is seen or heard, to derive information from it and to return it to the user in a supportive manner by using an intelligent system in the background. The aim is to make the development of the interaction as intuitive as possible and to define a familiar modality in speech, gaze and gesture or touch so that the application can be operated immediately without prior knowledge. Development of a virtual cooperative training room. This can be conceived as a live training room, enriched with virtual content and allowing for location independence. The AR glasses should be used to give the patients hints which objects from the real scene can be used for the training sessions. With the help of sensor data from wearables, simulation models are built that provide a representation of the user's behavior. These models will be used to support machine learning. Ascora GmbH is an SME based in northern Germany. Ascora is developing and selling software as an Independent Software Vendor with products that are used around the world. Ascora is one of the leading providers of software apps in Germany with more than 8 Mio users and more than 2.8 active newsletter subscribers; applications include desktop applications as well as web and mobile apps. Ascora has broad experience in creating scalable systems including scalable data management with experience in the big data domain. Because of its large user base, servers of Ascora currently manage between 100 and 150 Mio messages/month. As a fast-growing company, Ascora has been awarded by Deloitte with the Technology Fast 50 Award for Germany in 2016. Ascora is involved in several projects within the research and innovation domain including where Ascora cooperates with companies and researchers from many European countries. Ascora has broad expertise in realizing personalized applications with a strong focus for creating fully adaptive solutions based on service oriented architectures and distributed system integration. 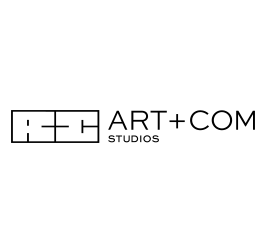 ART+COM Studios have been designing and developing new media installations and spaces since 1988. The design company uses state-of-the-art technology as a medium of artistic expression and for the interactive communication of complex information. Attracting clients in various business sectors, including culture and research, ART+COM has worked for Autostadt Wolfsburg, BMW, Changi Airport Singapore, Deutsche Bank, Ottobock as well as for renowned museums and exhibition spaces worldwide. The development of Augmented/Mixed/Virtual Reality and Intuitive User Interfaces and Interaction Design is at the core of ART+COM’s research activities and has been explored in multiple projects. 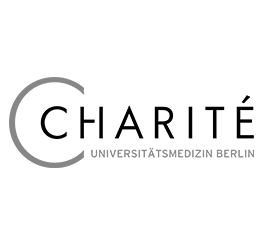 The interdisciplinary research group Geriatrics of the Charité-Universitäts-medizin Berlin (CFGG) has been researching successfully in the fields of Geriatrics and Age & Technology since 1990. The aim of research projects is the development of new technologies for the creation of integrated and intelligent living environments for the preservation of health and self-determination. Further focal points are the general usability research under consideration of the user centered design according to DIN EN ISO 9241-210. Within the fMOOC project, evidence-based training programs have already been developed and tested with seniors.Experiences with the use of near-body sensors by seniors were gained in the projects MORECARE and Alfred. Beuth University of Applied Sciences Berlin belongs to the ten biggest universities of applied sciences in Germany and is one of Berlin’s old-established universities for applied sciences. Nearly 300 professors conduct teaching and research with 13.000 students in over 70 different degree programs in STEM fields at bachelor and master levels in Europe’s startup metropolis Berlin. The Beuth University of Applied Sciences also has a long history in commercial exploitations of scientific results with more than 80 spinoffs. In recent years, Beuth has experienced a steady growth of third-party funding, demonstrating its capacity to handle different types of R&D projects. The main focus is here technology, digital media and life science. The computer graphics and interactive media (CGM)-Laboratory focuses on computer graphics, digital image processing and multimedia streaming. The lab conducts active research in topics such as virtual reality or augmented reality, 2D or 3D animation or mobile media. For this purpose, the laboratory is equipped with the latest technology and hardware. The core competence of the computer-use in production (CIP)-Laboratory, apart from teaching, is application-oriented research in the field of various simulation methods, as well as 3D visualization. The CIP laboratory therefore offers important resources and experience, including modelling, simulate or visualize of complex systems (multi-body, fluid etc). A number of units and programs at Beuth, including the International Office, the Gender and Technology Center and the [email protected] program, are dedicated to promoting diversity, social inclusion, equality, gender balance and participation of disadvantaged learners such as refugees and migrants. Beuth has over 50 Erasmus partnerships in Europe as well as over 70 global partnerships with mobility programs. Moreover, Beuth is also connected through the GE-4 network for student mobility with over 30 partners world wide. 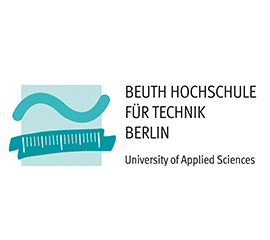 The Beuth University of Applied Sciences is recognized both nationally and internationally for its multidisciplinary approach to research and education, and has a successful track record of working closely with industry, research institutes, NGOs and other public and private organizations across Europe and beyond.